Or, how Microsoft may have just invented the future of intensive Bible study. In this image, the man is apparently so obsessed with going to Maui that he maintains a Sims-like vacation paradise on his counter. The TV, “Recipes” button, Maui simulation, and to-do list are all virtual—using the device on his head, only he can see whether his Sims manage find a staircase to the beach or if instead they simply leap the fifteen feet off the cliff to the sand. At this year’s BibleTech conference, I’m going to discuss why the idea of the “digital library” doesn’t appeal to certain kinds of people, and one aspect of the discussion involves the tension between print books and digital ones, each of which has advantages and disadvantages. Microsoft’s holographic technology (I recognize that one, they’re not really holograms, and two, what I’m describing here may go beyond what’s possible in the first devices) presents an intriguing way to bridge the physical and digital worlds of Bible study. Certain kinds of people prefer to study from print Bibles, and for them digital resources serve as study augmentations: parallel Bibles and commentaries feature prominently in this kind of study practice. The melding of physical and digital has always been awkward for this type of person, although tablet computers have eased this awkwardness somewhat. Still, the main limitation of digital resources for this person is space; small screens (compared to the size of a desk) don’t provide enough room to look at very many resources simultaneously, forcing them to toggle between resources. Edward Tufte calls this phenomenon being “stacked in time” rather than “adjacent in space,” saying that the latter is generally preferable. In this image, only the physical Bible and the desk are actually there. The rest of the text appears to float on top of the desk, providing enough room to engage in the kind of deep study that you might crave. Here I imagine that you, wearing holographic goggles, have tapped Psalm 27:1 in your print Bible. The goggles recognize the gesture, draw a box around the text in your Bible, and provide all sorts of supplementary material in which you’ve previously expressed interest: photos for some sort of illustration, various commentary and exegetical helps, and cross-references. The digital resources displayed on the desk are interactive, letting you tap and scroll much as you would on a tablet computer. It’s a tablet without a tablet. 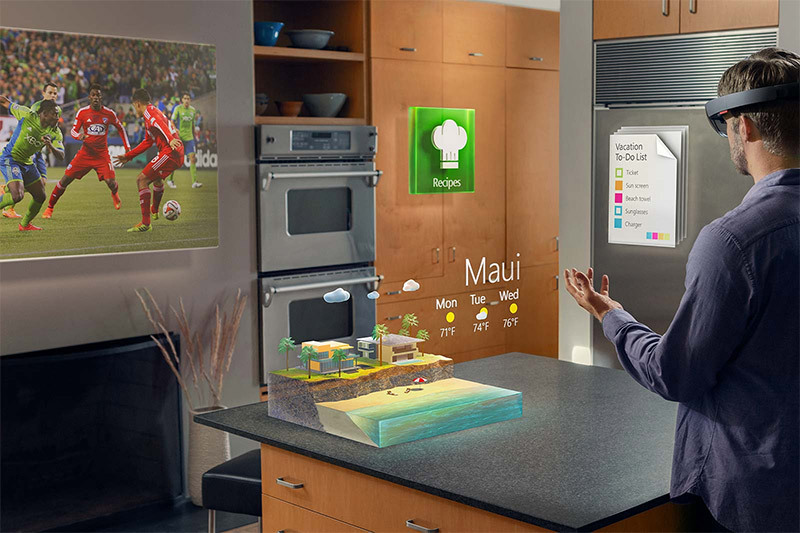 This image limits content to walls, but Microsoft’s HoloLens demo shows that the content could just as easily exist as three-dimensional objects in the middle of the room. And while I focus on low-density information displays here, there could easily be hundreds of information cards. Do you want to conduct a keyword search with hundreds of results? You can see all of them at once, all around you, rather than paging through them a few at a time. 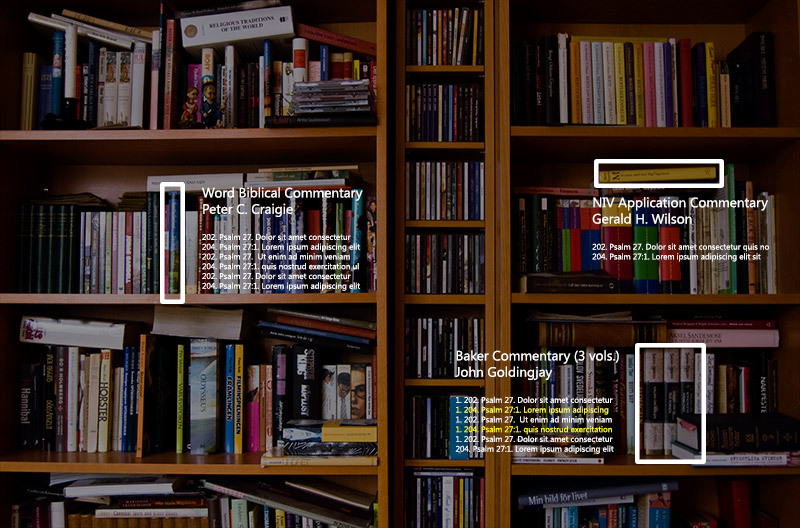 Here the holographic goggles have identified relevant books for you and show you where they are on your bookshelves, in addition to providing relevant excerpts for you to peruse. (The goggles know the page numbers either because you own the same volume digitally or because you originally read the book with your goggles on, and the goggles remember everything you read, even if you don’t; it’s like a super-Evernote.) The goggles surface passages related to the verse you’re reading and even remember passages you’ve highlighted (the yellow lines in the image). You can interact further with the holograms, looking through more search results, perhaps, or you can pull one of the books off the shelf and physically peruse it. Finally, and most obviously, holograms push the 3D models, timelines, and maps that are now study-Bible staples into new dimensions of interactivity. They can literally pop off the page and expand into space, letting you manipulate them in ways that are impossible in the 2D space of a screen. 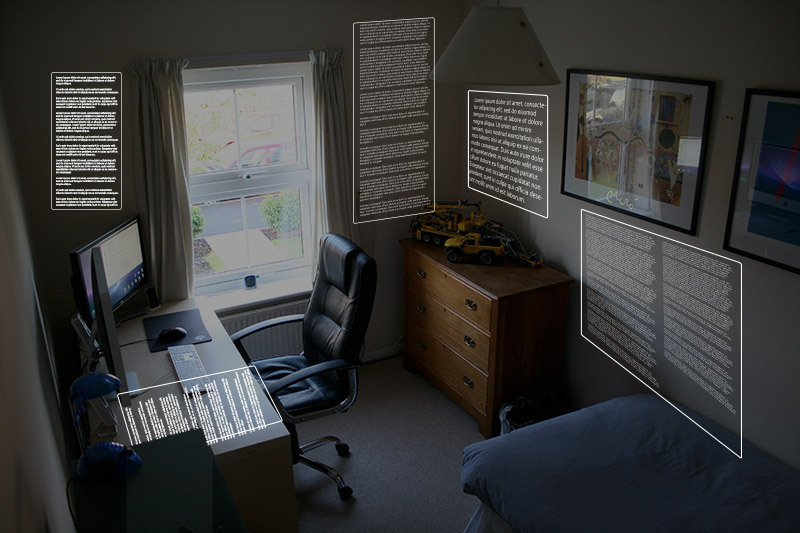 Holographic technology neatly sidesteps several limitations of current digital Bible study and could potentially usher widespread, transformative, digitally assisted Bible study. Or they may be just too geeky-looking. We’ll have to see. Photo credits: endyk, Hc_07, 4thglryofgod, worshipbackgrounds, listentothemountains, coloneljohnbritt, 4thglryofgod, titobalangue, quoteseverlasting, steven_jamesP, nlcwood, netzanette, and williamhook on Flickr. The terrible Photoshopping is all my fault, not theirs. Previously available were many places in Jerusalem, like the Via Dolorosa. But the new imagery covers much more area–I can imagine it being particularly useful in Sunday School and classroom settings, where a semi-immersive environment communicates more than static photographs. Via Biblical Studies and Technological Tools. Walking around an archaeological site–whether an active dig or excavated ruins–makes you wonder what it would be like to see the site in its glory days. Existing computer tools make it possible to model small-scale sites virtually (a building, perhaps), but anything larger than a city block would take a long time to create. Even a small city is beyond the capabilities of any but the most dedicated team. The creators of this video started with street plans and a variety of historically correct architectural models. A computer then generated buildings that fit the excavated ruins, resulting in a city that you can tour virtually. While it undoubtedly has inaccuracies, the result is compelling. These projects don’t often generate interior spaces or simulate objects like furniture, both of which dramatically increase the complexity of the simulation for only a modest benefit. But there’s no reason why we couldn’t model interior spaces. 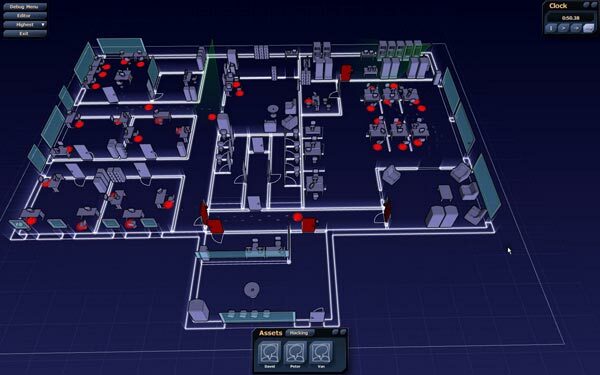 A forthcoming game called Subversion, for example, uses procedural generation on both macro and micro scales: it generates both complete cityscapes and architectural floorplans of the buildings that it creates. Recreating interiors for ancient houses is fairly straightforward: floorplans weren’t nearly as complicated as they are today. Imagine walking around ancient Capernaum, for example, and visiting the house where people lowered a paralytic through the roof. 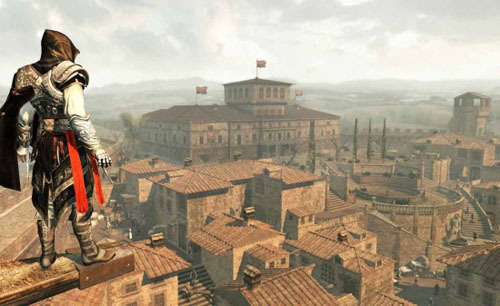 Architecture plays a crucial role in the story, a role that a virtual-reality model would help illuminate. Procedural, Inc. creates software for procedurally generating cities, both modern and ancient. Rome Reborn from the University of Virginia recreates ancient Rome using a combination of hand-modeled buildings (for thirty models and 250 elements) and procedurally generated buildings (for the remaining 6,750 buildings). Academic papers provide more technical detail, especially the one by Dylla, Kimberly, Frischer, et al. (PDF). They use the Procedural, Inc. software. A Subversion video shows the steps a computer goes through to generate a cityscape. Procedural 3D Reconstruction of Puuc Buildings in Xkipché demonstrates an academic application of the technology applied to archaeology. Magnasanti talks about the “ultimate” SimCity city and was the inspiration for this post. You are currently browsing the archives for the Virtual Reality category.